The most interesting jobs are often the most unexpected. We received a phone call, crackly with long distance, from an organisation called Horn Relief. They’d heard our name, seen our work and wondered if we might be able to help them with their own brand. We hadn’t heard of Horn Relief. We should have done. They were – are – a very impressive humanitarian agency based in Nairobi and working across Somalia, Kenya, and South Sudan to tackle poverty. Their founder, Fatima Jibrell, was renowned in the environmental field for her work to end the devastating coal trade in Somalia. They’d pioneered the use and regulation of cash transfers in Africa. They were working on bold new projects to tackle the root causes of poverty in East Africa and beyond, like building a new jetty in Somalia to try and reinvigorate the shipping trade. Interesting, important work. In short, they were changing the way people think about and deliver aid in Africa. Yet very little in terms of communication had been done to promote the outstanding achievements and changes that Horn Relief had made over the years to African communities. What’s more they had a name – Horn Relief – that not only locked them to their past as a relief agency working in the Horn of Africa, but had potential to cause confusion among Western audiences, including institutional funders in the US, a key source of income for the organisation. They needed a way of telling and packaging their story that would appeal to a brand savvy Western audience, but didn’t lose the authenticity that made Horn Relief such a potent force for good in Africa. 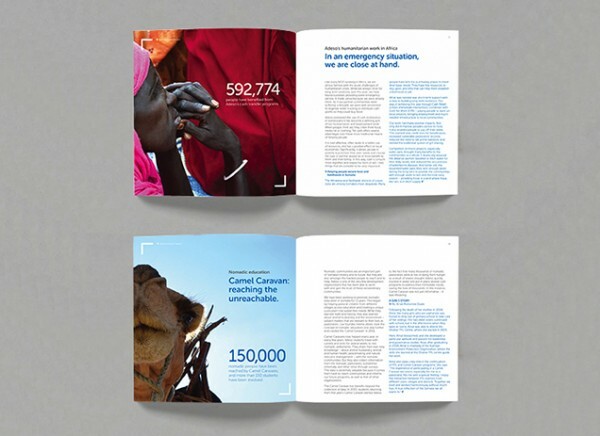 This was an involved and complex branding project with multi-stakeholders and a board located in both US and Africa. Much of the work was done in the UK –stakeholder research, landscape mapping, peer review and the other essentials of any rebrand. 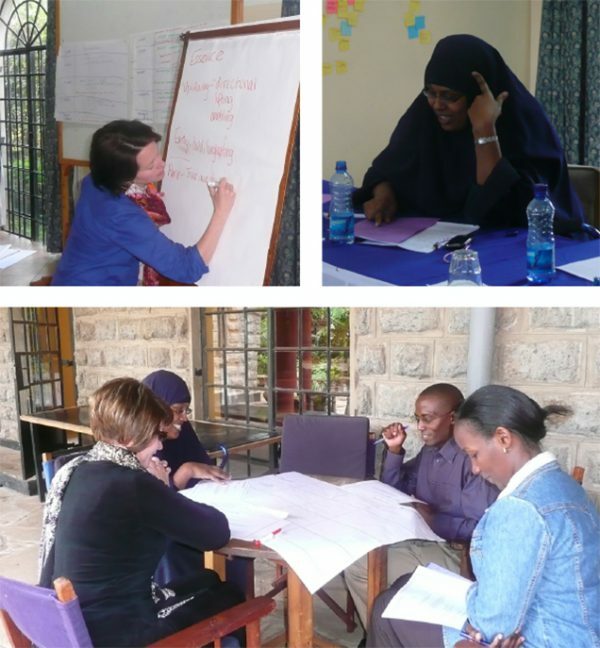 Further in-depth interviews and a brand positioning workshop to establish the vision, mission and values of the organisation were conducted in Nairobi. We arrived at what we believed was a truthful and distinctive positioning for Horn Relief – that of an organisation working to create an Africa that was not dependent on aid but on the resourcefulness of Africans themselves. It was a sentiment or idea we heard expressed time and time again when talking about or with Horn Relief and something we felt we simply had to build their brand around. What also became clear was that the most pressing issue was their name. It had to change and it had to change before we could embark on further brand development. Naming is tricky and this project was especially hard. The organisation had been known as Horn Relief for twenty years. They’d built up a reputation with that name and it was of deep sentimental value to the founder and to many of the senior team. Keeping it was the easy option but keeping it would also hold them back. Once we had agreement that a new name was needed we had to find a new one. Naming is subjective. It’s an art more than a science, though there are some parameters – descriptive names (British Airways) versus evocative (Virgin) versus compound or invented name (Qantas). These can be useful to gauge where a client feels comfortable but don’t necessarily make the process any easier. There are no sure bets in naming. It took several weeks before we arrived at name that both we and Horn Relief were happy with. Our initial view that a more creative/evocative name suited the spirit of Horn Relief met with great (and perhaps justified) resistance from Horn Relief. Yet we felt that their preferred option of a descriptive acronym type name, of which the development world is littered, was just not distinctive or interesting enough. The name we eventually arrived at – Adeso, an invented word derived from the longer hand African Development Solutions – was somewhere in the middle. 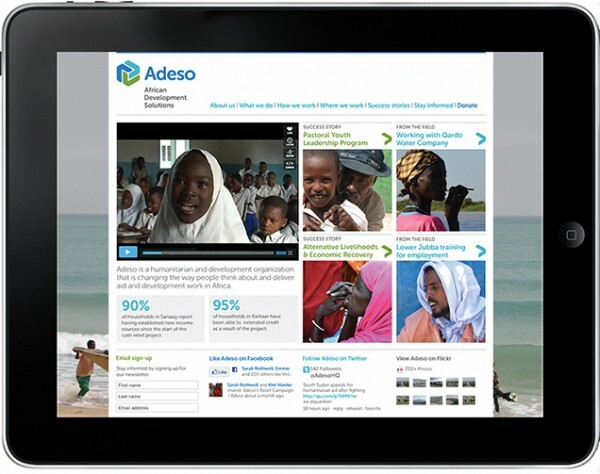 By happy coincidence it was also the word for ‘now’ in Italian (one of the official languages in Somalia), apt for the dynamic, results-focused Adeso. By contrast, finding an visual and verbal identity for the new Adeso was more straightforward. Adeso needed a brand that was credible, professional, weighty. Something that could stand up to the scrutiny of US funders . But we and Adeso also wanted to create a strikingly different portrayal of Africa. No reds, or oranges or ochre. No photographs of food parcels being handed out. Instead, beautiful and hopeful images and stories of African ingenuity and strength that talked to Adeso’s vision of an Africa that is not dependent on aid, but on the resourcefulness of its people. – a memorable stakeholder comment that helped inform the visual direction of the Adeso brand. Ensuring the brand worked confidently online – a key place for donors and funders – was also a priority, so we embarked on user journey planning and created a wordpress CMS with an easy intuitive backend for users, so staff could easily keep the site up to date. 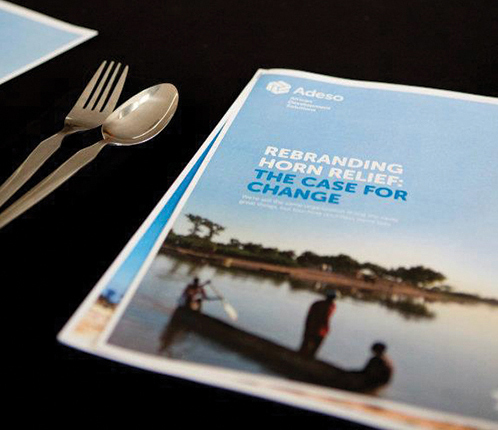 The Adeso rebrand was a year-long process from phone call to brand launch. 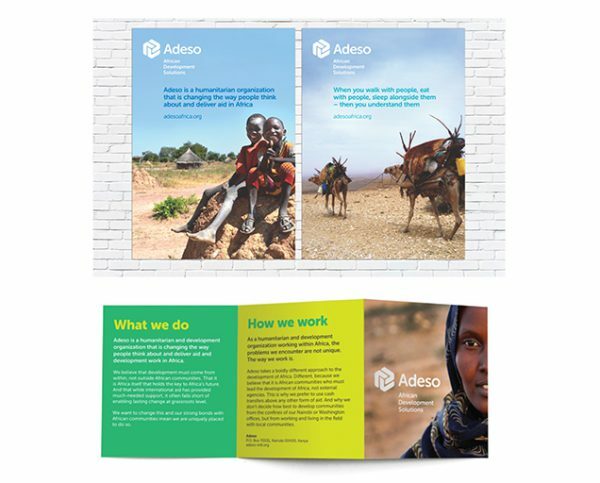 We continued to work closely with Adeso to deliver the brand roll out and provided the tools for them to proactively manage their fundraising and communications. It can be difficult to gauge the success of a branding project – how do you measure the success of something as intangible as brand? It lacks the clear KPIs of a campaign and can take a few years to have an impact. One measure of success was in the name. Sometimes when you rename something it just never sticks. You revert back to the old name by accident. The new name feels uncomfortable, strange. Yet this never happened with Adeso. From the moment we renamed them it just stuck – with us, with Adeso staff, even with Adeso’s founder. It was difficult but we got there and created something distinctive and true.